‘ If anything, ‘Feeling My Heart Run Slow’, ‘Things People Want’, ‘Friends Make The Worst Enemies’ and new single ‘Grey House’ are raised to a new level. Parallels are easily drawn between the songs on ‘Attack of the Grey Lantern’ and ‘Spooky Action’. On record they are synth lead, with a pop edge. Live, they are a new beast, Ben Sink’s guitar lines and Paul on rhythm adds meat to the bones but Catherine’s keys are vital to holding the songs together. All the more impressive is Jon Barnett’s drumming on Feeling My Heart Run Slow, the broken up beats and constant changes in rhythm that are so essential in the original version are replicated and accentuated with a flourish that only great drummers can achieve. The album is so strong that the anticipation for Mansun tracks is lower than you’d expect which means when the main set is closed by their biggest single, ‘I Can Only Disappoint You’ it is met with almost surprise, but no little joy, people all around singing themselves hoarse. Book early to avoid disappointment, links to ticket booking agencies can be found HERE . 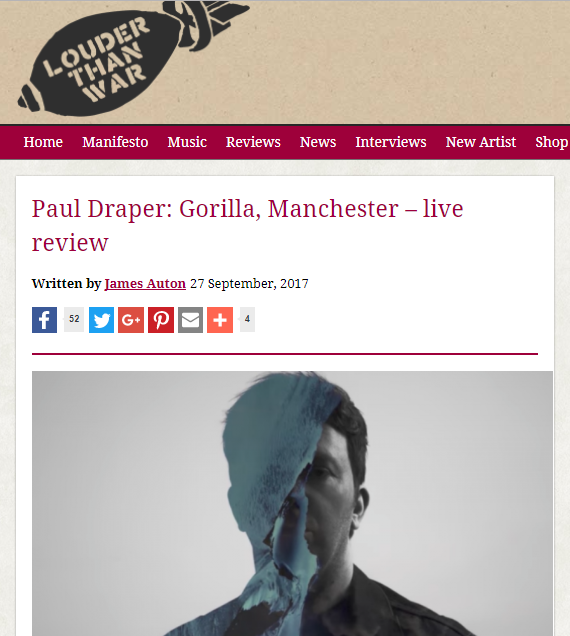 You can read the full Louder Than War review HERE .